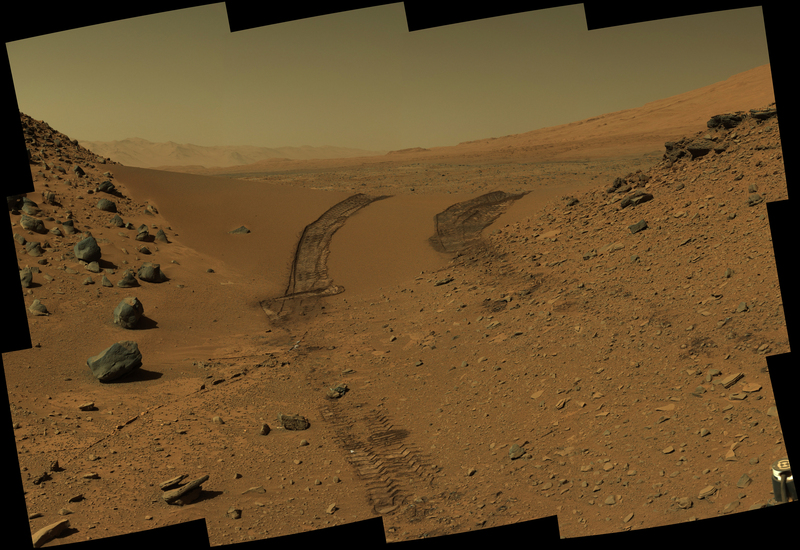 This look back at a dune that NASA's Curiosity Mars rover drove across was taken by the rover's Mast Camera (Mastcam) during the 538th Martian day, or sol, of Curiosity's work on Mars (February 9, 2004). The rover had driven over the dune three days earlier. For scale, the distance between the parallel wheel tracks is about 9 feet (2.7 meters). The dune is about 3 feet (1 meter) tall in the middle of its span across an opening called "Dingo Gap." This view is looking eastward. The image has been white balanced to show what the Martian surface materials would look like if under the light of Earth's sky. A version with raw color, as recorded by the camera under Martian lighting conditions, is available as Figure 1. Note: For more information, see PIA17945: Curiosity Mars Rover's Shadow After Long Backward Drive, PIA17946: Map of Recent and Planned Driving by Curiosity as of February 18, 2014, and Curiosity Adds Reverse Driving for Wheel Protection.